The itinerary for Global Connections 2016 included important historic sites of the U.S. civil rights movement. Here the group gathers at Montgomery’s Dexter Avenue Baptist Church, where Martin Luther King Jr. served as pastor from 1954 to 1960. Despite the achievements of the last 60 years, civil rights and social justice remain as two of the most central issues in any discussion of current American life. Understanding them requires looking at their historical context and exploring their broad range of implication and influence. 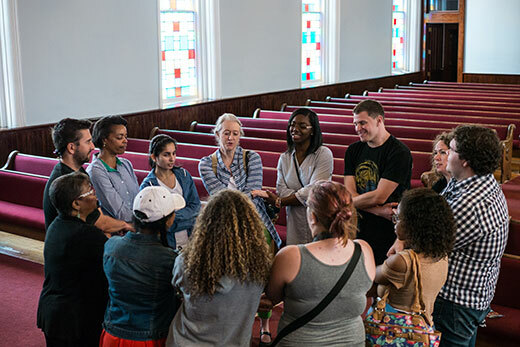 Helping students reach such an understanding was the goal of Global Connections 2016, “Civil Rights and Social Justice in the U.S. South,” a 10-day study tour through five southern states, led by Oxford College faculty members Susan Ashmore, associate professor of history, and Molly McGehee, associate professor of American studies. Global Connections is a program of Oxford’s Office of Religious and Spiritual Life and is supported by the Pierce Institute for Leadership and Community Engagement. Founded in 2006, this travel experience has a mission of helping students connect religious and spiritual convictions with justice issues such as peace, poverty, human rights and the environment. The scholarly interests of the two faculty members made them natural complementary leaders for this summer's trip. Ashmore is an expert on southern U.S. history and teaches Oxford’s course on civil rights history in the U.S. She is the author of "Carry It On: The War on Poverty and the Civil Rights Movement in Alabama, 1964-1972." McGehee teaches Oxford courses on African-American literature, southern literature and U.S. race relations; her academic research has focused on studies of U.S. southern culture and modern and contemporary southern writers. Their aim went beyond just informing the eight Oxford students who were selected for the trip. “It is our hope that they are inspired to become agents of change for their generation," Ashmore says. The first days of the trip focused on Alabama. Among the places the group visited were Montgomery’s Dexter Avenue Baptist Church, where Martin Luther King Jr. was pastor; the Southern Poverty Law Center; and the Greyhound Bus Museum. In Selma they walked the Edmund Pettus Bridge, and in Birmingham they toured the Sixteenth Street Baptist Church, site of the 1963 bombing that killed four young girls. From Birmingham, the group traveled to Jackson, Mississippi, touring the homes of author Eudora Welty and slain civil rights leader Medgar Evers. They met with Ed King, a retired Methodist minister who was active in the civil rights movement in Jackson. Other Mississippi stops were in Sumner at the interpretive center named in honor of Emmet Till, whose 1955 lynching inspired greater civil rights activism, and in Money at the dilapidated store where Till allegedly whistled at a white woman. In Memphis, students visited the National Civil Rights Museum at the Lorraine Motel, the site of King's assassination in 1968. The group also went to Stax Records, which launched many African American musicians in the 1950s and 1960s. Moving on to Little Rock, they toured Central High School, now a National Park Service historical site, where integration of the student body in 1957 sparked violence and riveted national attention. The trip ended in Oxford, Mississippi, site of the University of Mississippi, where they met with Susan M. Glisson, director of the William Winter Institute for Racial Reconciliation. There was far more, of course, on the itinerary, as well as time for fun, exploration and — naturally — barbecue. Nisaa Maragh, a rising sophomore from Loganville, Georgia, says the trip gave depth to her knowledge about the struggle for civil rights in the United States. Nia Bilal, a rising junior from Bronx New York, also gained new insight from the summer trip.